It was the beginning of a new life for the House of Valentino yesterday when Alessandra Facchinetti presented her premier collection. 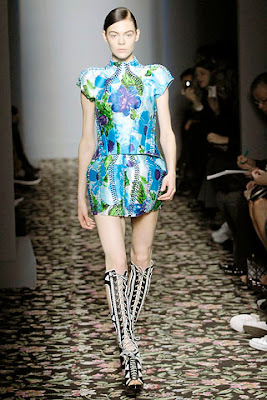 The collection was sophisticated, and beautiful and very Valentino but in a completely modern way. I think that Facchinetti may just be the perfect fit as the house's successor. I think I loved almost every single piece, especially the coats. I never saw myself as a Valentino girl until now. So if the intention of the House was to breed some new air and open the door to a new generation (literally) it has already proven successful. The YSL girls backstage at the fall 2008 runway show. Is Anna Wintour and her daughter Bee Shaffer sending a statement that we must now dispose of our trusty wool coats and frumpy down jackets and opt for a more sophisticated outerwear look that consists of the classic trench coat, even in the cold of winter? 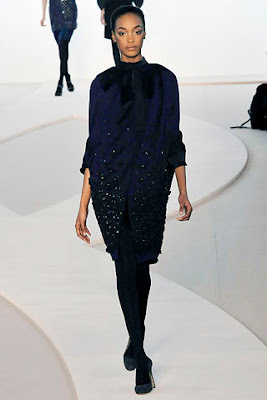 The Stella McCartney fall 2008 runway was all about draping, grey and skin. Either her drapey tunic-like dresses, and knee boots were de rigueur or it was her strapless little numbers that had the most impact. Note to Self: Re: Strapless little numbers - If I am to sneeze in it, it would most likely fall off, so either I must refrain from any kind of movement or buy a lot of tape. I, however, loved the collection with the 6 following looks my favorite. 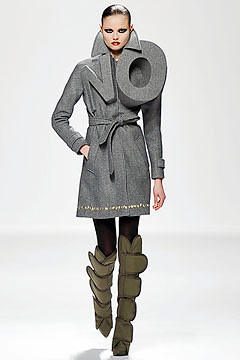 Only Viktor & Rolf could pull this off. A perfect expression of their persistent frustration with the speed of fashion..."We love fashion but it's going so fast...we wanted to say NO this season," said the duo as reported by style.com.... and so we get the NO trench. Will we see this trench on the retail floor come July or is it simply for the fun of V&K's show antics? The evolution of the Balenciaga jacket over the past few seasons is a study on its own...definitely worthy of any museum's permanent collection. It seems as though Paris does Anna well, quite well. Seen here at the Balenciaga fall 2008 runway presentation smiling for the first time, well the first time I have ever seen so much as a tooth out of her usual stern photo-ready smirk. What had Anna smiling so, is what I would like to know. 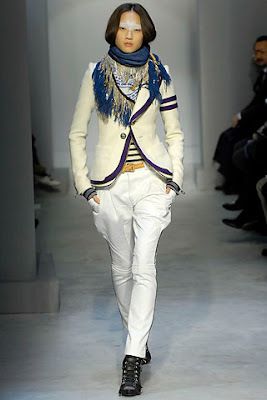 Color reigned on the John Galliano for Christian Dior fall runway. It was all about bright, overdone, exaggerated and loud looks, be it orange, purple, pink or even white, each look was unique in itself. 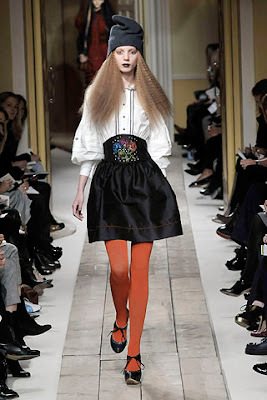 From bead embellishment, puffed hemlines, large brimmed hats, A-lines and boxy jackets, it was a very opulent yet very wearable and sellable collection...hair and all...I’m all for bringing back the '60s bouffant. In Las Vegas for the next 4 days at the WSA Shoe Show once again assisting my friend with her fall buy. I hope to bring some news on whats hot in footwear for fall 2008. My eyes are open to finding new and interesting lines. I will try my best to update over the next couple of days. I was in the Alice & Olivia showroom yesterday assisting one of my friends with her fall buy. Besides the fact that the showroom is a chic palatial room, I felt like I was walking into my fantasy closet. Skimming the "fantasy" racks my mind immediately ran off to me finding myself alone in this grand room (did I mention there is an all white fireplace along with a crystal chandelier which take the main focus) with the racks of clothing all to myself. Some people aspire to become writers, doctors lawyers, but after yesterday, my soul aspiration is to have a closet filled with Alice & Olivia! According to American Apparel, Nylons, yes those stretchy leg coverings that we have made a mainstay in our wardrobe, turns 70 this year, and in celebration of the ubiquitous legging, AA has launched an anniversary collection of 10 new styles and 34 colors. My dibs are on the opaque pantyhose in midnight blue to wear with the season's multitude of floral dresses. Taking the anniversary a step further AA enlisted the Los Angeles Contemporary Dance Company to perform a mini dance recital featuring their tights. Very cool. Would love to see this make it to the TV screen. It is clever enough to rival the Gap and Old Navy's brilliant and very colorful (no pun intended) media campaigns. Set aside all the bells and whistles that filled the fall 2008 Luella collection, and set aside the horror inflicted inspiration, Luella injected the season with key stand out pieces. For example, the dresses, strip them down to just the dress, eliminate all the frills, add some heels and you have one stellar outfit. 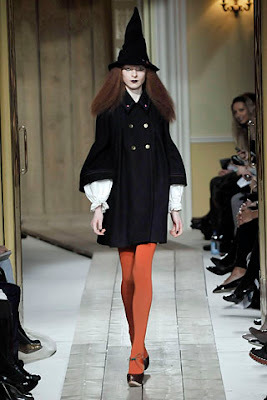 I especially loved the bell sleeved coat (minus the witche's hat) and the high-waist jewelled encrusted skirt. You know you have made the switch from New York fashion week to London fashion week when you see a patch-eyed Agyness Deyn in an electric purple House of Holland get-up. Welcome to young London fashion, as per style.com. Andre Leon Tally (seen here at the Marc Jacobs fall 2008 show) is one of those fashion people who could get away with wearing anything, including floor length furs and satin capes but this is a slightly questionable look. 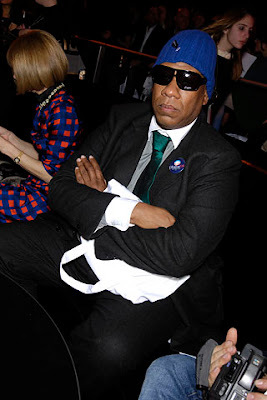 He actually reminds me of Jay-Z...was that his inspiration for the night?